Umbrellas serve an important purpose to people. Apart from protecting them from the heat of the sun, they also keep them dry when it rains. But not many people are aware that the umbrella also serves photographers well. This tool helps them in the lighting aspect of photography particularly when shooting indoors. Using this sun and rain protection tool is a great help for those serious in their photography hobby. In particular, it assists photographers in achieving professionally lit images. 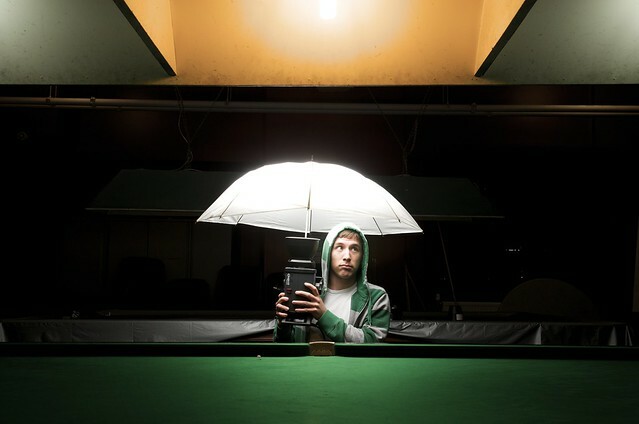 The umbrella diffuses light to enable you to achieve a softer lighting in your images. So instead of letting light directly focus on the subject, the umbrella bounces off the light in different directions. The result is a clearer image with softer shadows—or no shadows at all. Basically, there are two colors of umbrella you can use when shooting. These are the black/silver and white, each with its own purpose. A white umbrella is normally best to use for indoor photography. This needs to be open when using it to achieve a softer glow. To use it, you have to shoot light directly through the umbrella for a softer appearance. There are also other techniques that you should keep in mind. To get rid of shadows, for instance, you need to angle your light. Put the umbrella in a position that will put the shadow behind your subject. This tactic is usually best for shooting portraits. The black/silver umbrella, on the other hand, is utilized to brighten your subject. This is not just pure black; it’s a combination of black on the outside and silver on the inside. This type of umbrella directs light on the silver or inner part of the tool so that it brightens a subject. Take note that despite light directed on the subject, the umbrella helps in preventing a washed out image. For a brighter image, the best technique is to use a combination of the white and black/silver umbrella. This will enable you to eliminate the shadow and make your subject glow. A good tip is to use the black/silver umbrella as your main source of light and then use the white one to diffuse the light for a softer appearance. It’s important to note that for those of you who want to be more creative in your images, just using the built-in flash may not be a good idea; it can create shadows and can make your subject a bit one-dimensional. But if you move the light source away from your subject and use an umbrella or any other type of diffuser, you can create softer light and achieve a clearer photo. Keep in mind that the size of the subject and the source of light affects the harshness of the shadows. In other words, a harsh light is the result of a small light source, while a big light source will provide softer light on your subject. If you’re after energy efficiency, you can use LEDs and fluorescents. They are great alternatives to the hot lights and are ideal for HD video and digital stills. For information about digital camera accessories, visit 42photo.com, New York’s legendary camera store in business for over 40 years. I would like to make HD videos inside my office. what is the better combination, 2 white umbrellas or 1 white and 1 black/silver? While I appreciate the information, it’s difficult to hear with that annoying music and could not finish watching. Wish the music was more minimal. I am taking photo’s of “old” photographs. Which type of lighting umbrella do you recommend?